You can also find information about the following mills on this interactive map (link). 1888 directory: Eastwood Abraham, cotton waste dealer (in this location). 1891: Building present on Ordnance Survey map, but not labelled. 1957: Named on Ordnance Survey map as Adelaide Mills (cotton). 1969: Building not present on Ordnance Survey map. Adelaide Mills, OS map, 1957. 1848: Not present on Ordnance Survey map. Owned by Thomas Radcliffe and Charles Newhouse, colloquially known as ‘Charlie’s Mill’. 1869: Sold to Barlow and Jones. 1880 directory: Jones, Son & Faulkner, cotton spinners, Schofield Street and Albert Mills. 1888 directory: Hoyle Richard & Co. Albert Mill, Green la. Hopwood. 1891 directory: Richard Hoyle and Co, 19,934 spindles, 248/508. 1922 directory: D. Healey and Sons here. 1937: Marked on Ordnance Survey map as ‘disused’. 1957: Marked on Ordnance Survey map as ‘furniture’. 2018: Building no longer present. 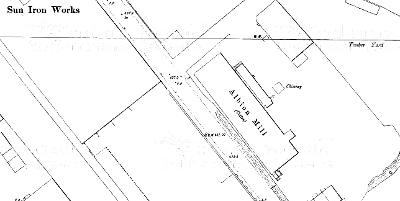 Albert Mill, OS map, 1928. 1869: Charles Newhouse, former owner of Albert Mill, became the owner. 1888: Albert New Mill Co. Limited, Albert New Mill, Green la. Hopwood (cotton spinners). 1891: Albert New Mill Co, Limited, 26,000 spindles, 188/328 water twist, 248/348 cop twist. 1922: D. Healey and Sons. 1947: Present on Ordnance Survey map. 1957: Not present on Ordnance Survey map. Albert New Mill, OS map, 1928. Sefton Street, across from Sun Iron Foundry. 1871 directory: Pearson and Newhouse, Albion mill (cotton spinners). 1880 directory: Pearson William, cotton spinner, Albion Mill; h. Birch house, Hopwood. 1891 directory: William Pearson, 12,000 spindles, 128/401, pin cops, 168/328 twist. 1891: Named on Ordnance Survey map as Albion Mill (cotton). 1968: Building present on Ordnance Survey map. 1988: Building not present on Ordnance Survey map. Albion Mill, OS map, 1890. 1808: Edmund Ashworth listed as the fuller here. 1848: Named as Ashworth Mill (fulling) on Ordnance Survey map. 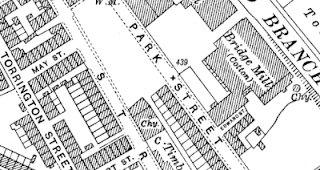 1890: Mill marked on Ordnance Survey map. 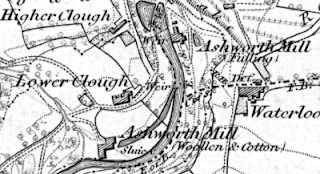 1908: Marked on Ordnance Survey map as Ashworth Mill (disused). 1956: Marked on Ordnance Survey map as Ashworth Mill (disused). 2018: Ruins of mill still present. Ashworth Fulling Mill, OS map, 1848. 1848: Named on Ordnance Survey map as Ashworth Mill (woollen and cotton). 1890: Building not present on Ordnance Survey map. Ashworth Mill (woollen and cotton), OS map 1848. 1847: Not present on Ordnance Survey map. 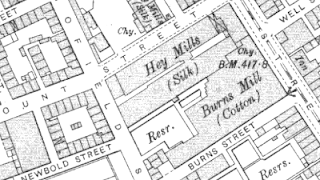 1890: Marked on Ordnance Survey map as Cotton Mills. 1922 directory: Howe & Coates here. 1957: Named on Ordnance Survey map as Atlantic Mill. 1977: Building expansion shown on Ordnance Survey map. 1986: Marked on Ordnance Survey map as ‘depot works’, in a new building. 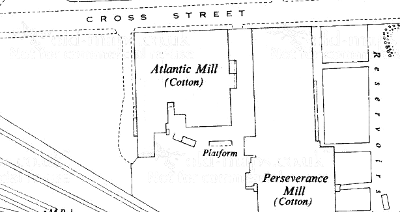 Atlantic Mill, OS map, 1956. 1848: Marked on Ordnance Survey map as Baitings Mill (cotton). 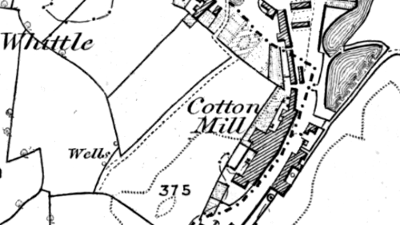 1890: Marked on Ordnance Survey map as Baitings Mill (cotton). 1908: Marked on Ordnance Survey map as Baitings Mill (fustian). 1923: Marked on Ordnance Survey map as Baitings Mill (fustian). 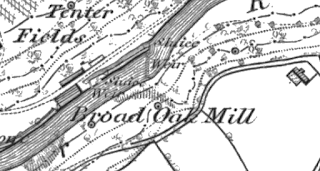 1961: Marked on Ordnance Survey map as Mill. 1986: Mill was known as Cudsworth's Mill and made cotton fustian cloth for corduroy material. 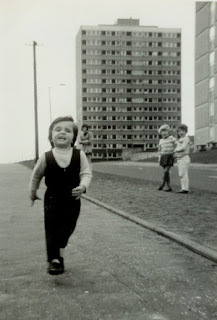 The building was demolished after 2000, and by 2003 there was a housing development here. Baitings Mill, OS map, 1891. 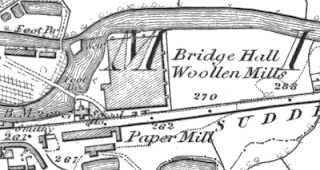 1890: Marked on Ordnance Survey map as Bamford Woollen Mills. 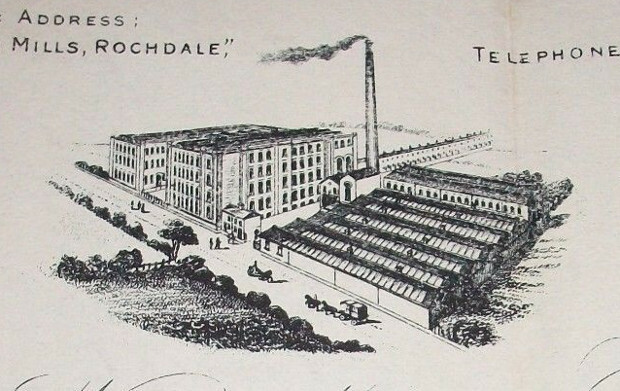 1880: Porritt Samuel & Sons, woollen manufacturers, Bamford Mills and Meadowcroft Mill. 1891: Samuel Porritt and Sons (and fullers and finishers), Bamford, woollen and Meadowcroft Mills; 160 looms, blanketings, tapes, roller cloths, &c.
Bamford Woollen Mills, OS map, 1890. 1830: Established by Booth Brothers, shuttle manufacturers. 1908: Sold out to Pilkington Ltd.
1920s: Pilkingtons moved to Highfield Mill, Springfield Street, where they still made shuttles and also operated 800 looms. 2018: Building still partially present and in use. 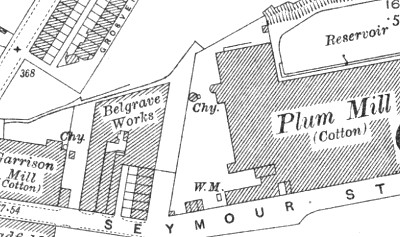 Belgrave Works, OS map, 1928. 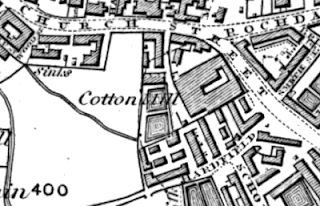 1848: Marked on Ordnance Survey map as Cotton Mill. 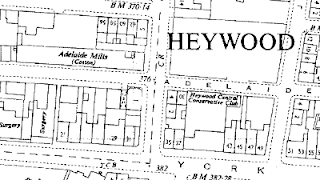 1891 directory: W.C. Wood and Brothers, Heywood and Birch Mills; 1,306 looms; Manchester office-25, Portland street. 1940s: Used by Salford Electronic Instruments. 1956: Marked on Ordnance Survey map as Birch Mills (cotton). 2018: Building still present and in use. Birch Mill, OS map, 1848. 1847: Small building marked here as Ned Mill. Has also been referred to 'Owd Ned's Mill' and Elbut Lane Mill. 1891 directory: Oliver Ormrod, Birtle Bleach Works. 1894: Larger buildings marked on Ordnance Survey map as Birtle Bleach Works. 1956: Marked on Ordnance Survey map as Birtle Bleach Works. 2018: Some buildings still present, converted to residences circa 2010. Birtle Bleach Works, OS map, 1890. 1824: Built for Thomas Ramsbottom. This was a full-scale 4-storey cotton spinning mill and weaving shed. 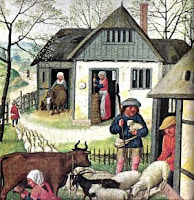 The mill produced its own gas and was powered by a large waterwheel and auxiliary engine. There were also three rows of cottages built for the workers. 1890: Taken over by Goulden, Adams and Company. 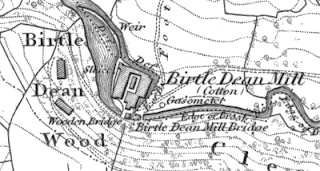 Birtle Dene Mill, OS map, 1847. 1847: Marked on Ordnance Survey map as Black Pits Mill (cotton mill). 1891 Directory: Blackpits Cotton Spinning and Manufacturing Co Limited; 15,670 spindles, 1811/361, twist; 474 looms, fustians. 1928: Marked on Ordnance Survey map as Black Pits Mill (cotton). 1938: Marked on Ordnance Survey map as Black Pits Mill. 1955: Not present on Ordnance Survey map. 2016: Black Pits Mill chimney restored. Black Pits Mill, OS Map, 1847. 1829 directory: Cleggs and Halls. 1850 directory: Cleggs and Halls, Bowling green Mill, and 1 Sussex street, Manchester (cotton spinner and manufacturer). 1871 directory: Berry George H. & Co., Bowling Green mill (cotton spinners). 1880 directory: Berry George Henry & Co., cotton spinners and manufacturers, William Street and Bowling Green Mills. 1891: Named on Ordnance Survey map as Bowling Green Mill (cotton). 1907: Building not present on Ordnance Survey Map. Bowling Green Mill, OS map 1848. 1891: Buildings not present on Ordnance Survey map. 1908: Marked on Ordnance Survey map as Dye Works. 1928: Marked on Ordnance Survey map as Bridge Hall Dye Works. Bridge Hall Dye Works, OS map, 1928. 1716: George Warburton was running a paper-making operation at Bridge Hall Mills by this time. 1776: Mills were being run by Thomas Crompton. 1810: ‘Owd Jimmy’ Wrigley took over the mills after the death of Crompton. 1829 directory: T. Blomley, Bridge Hall Mill. 1848: Marked on Ordnance Survey map as Bridge Hall Paper Mill. 1880: Lancashire & Yorkshire Railway Co. to open a freight-only branch line to the paper mills by this time. 1915: Roof collapse killed nine workers. 1924: Wrigley’s company went into voluntary liquidation. 1928: Transparent Paper Ltd renovated the mill and commenced cellulose film production. 1940s: Used for production of jettison fuel tanks during WW2. 1980: Transparent Paper closed. Premises were later home to Tetrosyl Ltd and Printpack Europe Ltd.
2018: Buildings still present and in use. 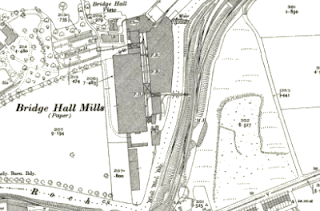 Bridge Hall Paper Mills, OS map, 1928. 1848: Marked on Ordnance Survey map as Bridge Hall Woollen Mill. 1890: Marked on Ordnance Survey map as Bridge Hall Mill (disused). 1908: Building not present on Ordnance Survey map. Bridge Hall Woollen Mills, OS map, 1847. 1871 directory: Tattersall R. J. and E., Bridge mill, Hopwood (cotton spinners). 1880 directory: Tattersall R. J. & E., cotton spinners, Bridge Mill, Hopwood. 1891 directory: Edward Tattersall; 30,000 spindles, 508/608 weft, 408/468 twist. 1922 directory: Operated by Tattersall, E Ltd.
1937: Marked as Cotton Mill on Ordnance Survey map. 1947: Not present on Ordnance Survey map. 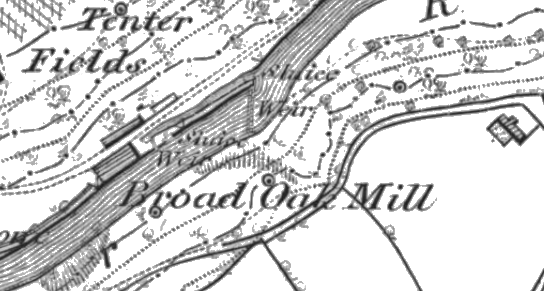 Bridge Mill, OS map, 1929. 1840: Open by this time. This was a two-storey mill, at one point being used for woollen manufacture upstairs and cotton spinning downstairs. It was later used for waste twills and calicos. 1891 directory: John Kay, Cheesden Bar Mill; 840 spindles, 48/88 weft; 25 looms, waste twills and waste calicoes. 1898: Closed after the water rights were sold for the construction of the nearby Ashworth Reservoir. Bridge Mill (Cheesden Bar), OS map, 1848. 1818: Marked on Greenwood's 1818 map. 1841 directory: Porter James, fulling miller, Broadoak mill. 1848: Marked on Ordnance Survey map. 1908: Marked on Ordnance Survey map as ‘disused’. 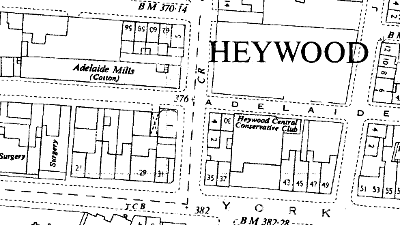 1928: Building not present on Ordnance Survey map. Broad Oak Mill, OS map, 1848. 1880 directory: Diggle Bros., joiners and builders, Bamford Road; and cotton spinners, Broadfield Mill. 1888 directory: Healey Brothers (manufacturers of all kinds of rope, twine, cotton & tubular banding; also main driving ropes for mills), Cartridge Steam Ropery & Broadfield Mill. 1891 directory: Wilton Spinning Co, Limited, 12,280 spindles, 348/548 weft. 1932 directory: JW and R Healey & Co. move to the mill (from Clegg’s Boiler Works, Wham). 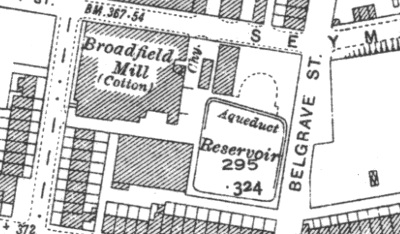 Broadfield Mill, OS map, 1937. 1848: Marked on Ordnance Survey map as Broadhalgh Fulling Mill. 1891 directory: John Ashworth, Broadhalgh Mill (fuller and finisher). 1949: Weir washed away in storm around this time. 1957: Marked on Ordnance Survey map as Broadhalgh Mill (woollen). 1971: Production stopped around this time. Sold to Frank Worrall in 1977, who demolished it. 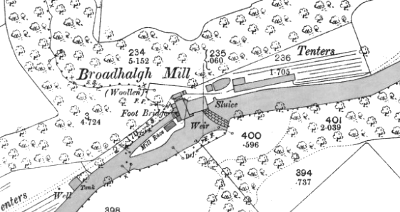 Broadhalgh Mill, OS map, 1891. 1841 directory: Kay John Hilton & Son, cotton spinners and manufacturer, Bridge St.
1851: Marked on Ordnance Survey map as Bridge Street Mills. 1888 directory: Brook Mills Co. Limited, Bridge St. (cotton spinners). 1891 directory: Brook Mills Co, Ltd., Brook and Springfield Mills; 25,000 spindles; 500 looms, plains, twills, jeanettes, &c.
1922 directory: Pearson & Morten. 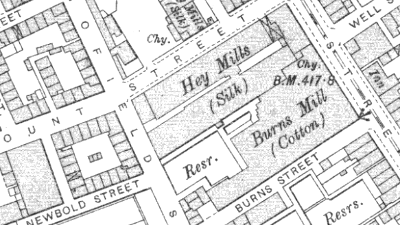 1957: Marked on Ordnance Survey map as Cotton Mill. 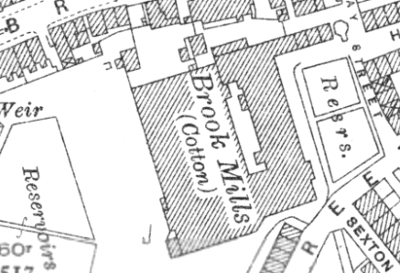 Brook Mills, OS map, 1929. Burns Mill - See Gooden Mill. Burns Mill, OS map, 1907. Barrett’s 1880 Directory of Bury, Heywood, Ramsbottom, Radcliffe and Pilkington. Commercial Directory and Shippers Guide, 1875. Hannah Haynes, Heywood, Chalford Publishing, 1997. John Hudson, Heywood in Old Photographs, Sutton Publishing 1994. Pigot and Co.’s national commercial directory for 1828-29. Pigot and Co.’s Royal National and Commercial Directory of August 1841. AV Sandiford and TE Ashworth, The Forgotten Valley, Bury and District Local History Society, 1981. Slater’s 1888 Directory of Bury, Heywood, Radcliffe and Ramsbottom. Worrall’s 1871 Directory of Bury, Bolton and district. Worrall's Cotton Spinners & Manufacturers Directory for Lancashire 1891. Worrall’s 1891 Directory of Bury, Bolton and district.